(NOTE: “Playing to your Weaknesses” is a series of articles I have been doing on my own blog since Avacyn Restored that cover all of the uncommons and commons in a new expansion and which ones I would choose to use as one of the 23 cards in a 40 card limited deck. For those of you uninitiated to limited, it simply means sealed and booster draft, where you open packs and then proceed to make a deck out of them. I’ve purposely left out the rare cards because it is much more likely that you’ll see multiples of uncommon and commons in your packs/pools. I got some really good feedback from my last article from a few people, so I’ll be trying to incorporate that into today’s. I know I’ve been talking a lot about draft (which will happen the most during this set in limited formats), but for the most part these cards would be great in your sealed deck as well. I am going to try and talk more about both their sealed and draft applications though to help us think about their effectiveness in both formats. If you have any other suggestions about the article, please let me know! 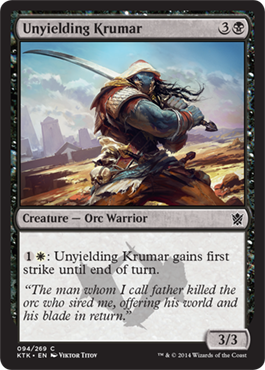 Unyielding Krumar will force you into playing either with Abzan or Mardu colors, but I think being able to activate his ability is worth it. A 3/3 body for 4 mana and activated first strike is economical for a common card. It fits your curve well and it’s 3 power/toughness will be able to take care of most of the non-multicolor cards you’ll go up against. He’ll especially be more effective in sealed due to the randomness of what cards you end up with. Your opponent might have 3-4 cards that are better than him, but he should have no problem with the rest. His value drops a little bit in draft but I still see him as a roleplayer in your deck regardless. I’d take him as my 6th-7th pick. 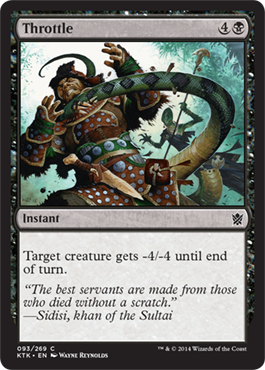 This card is basically Lash of the Whip from Theros but with a flavor update for the Khans set. If you don’t see Doom Blade or Hero’s Downfall in the set, then you’d be wise to take some form of removal whenever you can, especially if you’re playing in black, red, or white. Looking at the overall set, removal looks to be weaker than it ever has been. Everything costs 4 or more mana, and there is some sort of handicap on each one that keeps it from getting out of control and becoming too powerful. Throttle seems like it will hand a majority of the creatures in Khans though (thank god), and it is instant speed which is another thing going for it. If the format is slower like everybody is saying, the 5 mana won’t be that much of a problem. If you’re playing black in your sealed or draft deck, you’ll want at least one of these. In draft, I’d take it around my 4th pick or so just because of how rare decent removal is. 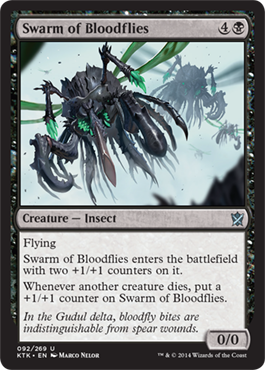 A 2/2 flyer is pretty “meh” usually, but Swarm of the Bloodflies gets pumped up whenever a creature dies, regardless of whose it is. 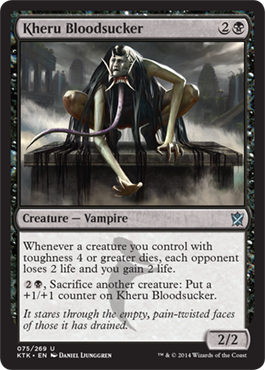 In an Abzan or Mardu token deck (see the Ascendancies), this card could become a deadly raptor very quickly. Play it before attacking, then make your opponent decide between taking damage on the ground this turn or taking it in the air the next. I think this card will most likely be a 4/4 flyer in your limited deck after a turn or two, and if you have any type of removal it becomes a lot more effective. Both sealed and draft decks are creature heavy so you should have no problem making it into a large threat. Not a first pick in draft, but I could see myself taking it around my 4th or 5th pick. If you’re playing Sultai colors, then this little birdie could come into play as soon as turn 3 (if you were to use Taigam’s Scheming for example). Otherwise, I think you can realistically be playing this for 4 mana on turn 4. Very rarely will you be paying the full 6 mana to play it, even in non-Sulta decks. Sultai Scavenger is a great card to have in both your draft and sealed pools thanks to the evasion it gives you and the power level. A 3/3 flyer is nothing to scoff at, and will be effective in Mardu decks to activate Raid, as well as graciously taking +1/+1 counters in Abzan builds. I wouldn’t regret taking this as my 3rd or 4th pick in draft, and it’s good to have in your sealed deck too. There are a few cards where delve doesn’t really help (Empty the Pits), but for this one I think it’s okay. We didn’t like using those 6 mana kill spells like Sip of Hemlock in Theros block, but we used them anyways because they destroyed everything with no restrictions. 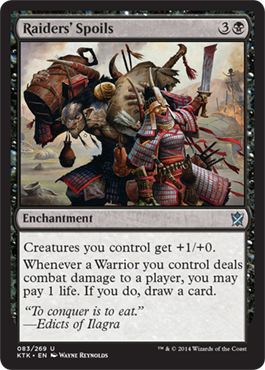 It will be best against Abzan decks or any of those Outlast cards, but realistically you want to keep this for your opponent’s finishers. When they drop that 6/6 or huge bomb, blast it. As I said with Throttle up above, there aren’t a lot of good removal spells in this block, at least not at common or uncommon. Therefore you should probably get this in middle of your first pack as your 6th or 7th pick. If you don’t have a way to lock down their win condition, you better be damn sure to have a way to kill it. Yay! They reprinted Orcish Oriflame (of sorts)! It’s actually much better than that though. The mana cost is the same, but it’s in a different color. It also gives the bonus to both attackers and defenders which is a definite bonus, and with the number of warriors in this set, you shouldn’t have a problem getting a few points of damage in from time to time and taking advantage of the second ability to draw a card. I think this card would be especially strong in an Abzan deck that has access to life gain, but it would also be great in an aggressive Mardu deck. I think this is one of the stronger black uncommons in the set. I don’t think I’d first pick it, but I’d take it early in draft. It would also definitely be in my sealed deck. I don’t think I’d cut it, no matter what else I had. The power bonus and card advantage seem to be really powerful in limited. Late in the game, this card will be absolutely crazy. After turn 6 you’ll probably be able to cast this for 1 black mana which is extremely powerful. You probably won’t want it in your opening hand, but you’ll be extremely happy drawing it after a few turns. This will probably end up being one of the best removal spells in Khans of Tarkir limited, so I’m recommending you take this as a first pick. The great thing about this new limited format is that it’s going to totally change how we think about sealed and drafting. Before, you never wanted to go into a third color unless your pool was extremely weak or if you had the mana fixing such as a Shimmering Grotto or Opaline Unicorn. Khans, however, will actually encourage you to go into 3 colors. That’s why you can get away with taking this early then go into a different color entirely for the rest of the first pack. Draft might be somewhat fast because people have more control over their curves, but in sealed you can be sure you’ll have enough time to fill your graveyard to maximize this cards benefit. Another Outlast card, but this time it’s in black. White had some really good Outlast “captains”, especially the one with flying and first strike, and with Mer-ek Nightblade they become even more effective. If I could draft the first strike Outlast captain and him, I definitely would. Most of these creatures cost around 3-4 mana which means you can play a somewhat fast deck without any 5 or 6 drops and just focus on “turning on” their abilities the second turn they are in play before swinging with the army on the following turn. 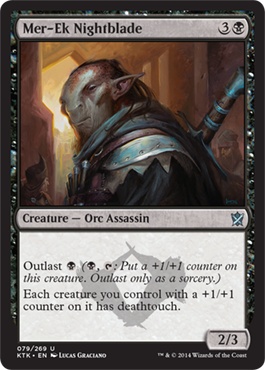 I think he’ll be really effective in Mardu builds with a few other Outlast cards. Giving a few of your creatures deathtouch at the same time makes it easy to attack but difficult for your opponent to block. Outlast cards’ synergy with Abzan Ascendancy is really strong. Imagine putting 4-5 of the captains in play on turns 4 and 5, then giving everybody a counter on turn 6 and attacking with them all. Even without any other ways to put counters on creatures, I think I’d still take him around pick 6 or 7 in draft. Butcher of the Horde isn’t the only creature that wants to devour your tokens. Kheru Bloodsucker can be absolutely deadly if you have a way to keep them coming. You can play aggressively and attack with all you have and just sacrifice the ones that would die to him. Cards like Take up Arms, Hordeling Outburst, and both Mardu and Abzan Ascendancies are going to be his best friend. While it’s always sad to see one of your larger creatures die, his other ability assures you that it won’t be in vain. If your 3/4, 4/5 or any other creature with toughness more than a Pillarfield Ox dies, you gain to life and drain them. This ability works best with Abzan colors as most of their multicolor creatures are huge. Green would also be a nice partner color for him. In a vacuum, without any of those other enablers to let you take advantage of his abilities, I would probably say it’s a decent card. It’s a good three drop in your mana curve in both sealed and draft pools, and he can turn into your finisher later on in the game. Don’t let him go past you on the table if you see him in draft. Here’s our new Sign in Blood/Read the Bones. 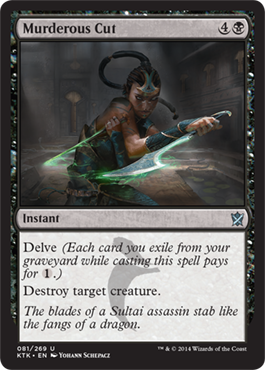 We basically get to draw 2 cards and lose 2 life, but at the same time we can throw 2 we don’t care for into the graveyard to fuel our Delve cards or pump up our Sultai dredge cards like Sidisi, Brood Tyrant. If I read this right, because you’re looking at your library then putting them into your hand/graveyard, then it should activate her/his 2/2 zombie token ability as well. I think I would probably take Raiders’ Spoils over this card, but it’s not a bad card to have in either your sealed or draft deck. The person that can dig to their win condition first will in most cases win. This also means helping you to hit your land drops in order to play them. This card would be good in Sultai and Abzan decks which look to be a little slower than Mardu ones. I feel like this could be a 7th pick in draft. You don’t really need it, but it could be really useful to you. Holy cow. 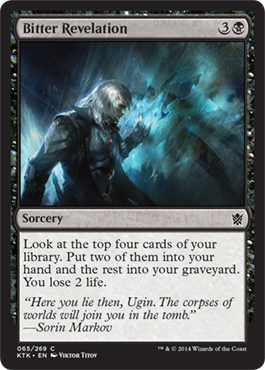 Regardless of whether or not you have to pay 4 life when it enters, it’s still a 4/5 for 4 mana in BLACK, which is really good. As far as efficiency is concerned, this will give most of the rares in the set a run for their money. If you’re playing Mardu, then most likely you’ll already have 1-2 creatures in play you can attack with. I would gladly sacrifice a 2/1 or 2/2 creature on turn 4 in order to get him into play without paying the 4 life. 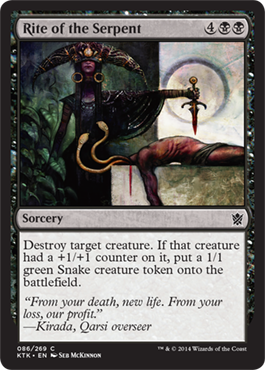 In Sultai and Abzan colors you might have to pay the 4 life more often, but GBW has a lot of ways to gain the life back. I could see this card easily becoming the best black uncommon in the set, and would take it very early in draft. If my rare was so-so in my first pack, I wouldn’t hesitate to take it as a first pick either. He’ll block almost anything, and will be very hard to kill 1 on 1. Dead Drop – good removal if you’re playing in Sultai colors, but less effective if you’re playing against any type of token creatures. Not something you’ll be playing early, but 5-6 mana to get rid of 2 creatures doesn’t seem like a bad trade off. Despise – limited decks are creature heavy, so there is a very good chance you’ll hit one if you cast it at any time during the game. If your removal isn’t that great, consider Despise in the mainboard. Black has a lot going for it. Their creatures are aggressive and have good abilities, and it’s the only color where you’ll find anything remotely close to GOOD removal. From a first glance, Mardu (RBW) seems like it’s going to be very good at the pre-release, and it will also be a strong draft archetype. A lot of these cards also fit well in Abzan colors and with its big creatures you could have a very good late game. With a slower format, Abzan might be the better choice, but I want to give both a chance in limited. I should be able to get Red out Friday morning, but due to a trip with the wife’s family to Nagano this weekend, I probably won’t be able to finish every article before the pre-release. I will be returning on Saturday and doing a late night event in town, then doing two more on Sunday. I should have Green finished by Sunday, and the final Multicolor post should be done by Monday. Thanks for being patient, and sorry I didn’t have the time to put all these articles up in time for your pre-release! Hopefully you’ll still find them useful for upcoming limited events such as PTQs, GPs, and drafts! See you again soon.